Welcome to another edition of Tim and Robin takes the kids for a walk.... Wait a minute, I guess this is really just the first edition. On this adventure we had a companion along with Clover Beene, our Trusty Sidekick, and let me tell you, she's a real kick in the side. 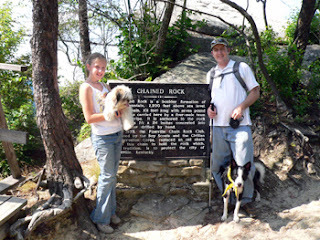 Anyway, it was the five of us, Robin, Ashby, Clover, Zorro, and me, in the car on our way to Pine Mountain State Park to see what all the fuss was aboot with the famed Chained Rock. 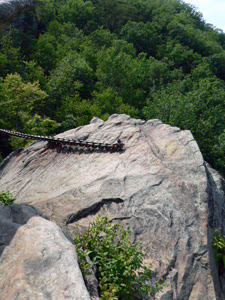 The story goes that in 1933 the big rock was chained to the cliff that faced it. This was something that the town felt necessary to ensure the bolder didn't fall from it's perch and crush the city below. 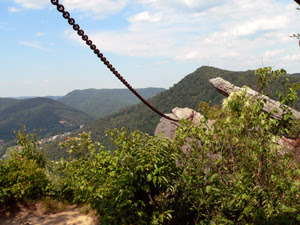 Apparently the local Kiwanis club with the help of the CCC and I believe some Boy Scouts, they lugged the chain links ,via pack mule, up the mountain and linked them between the cliff and the rock. 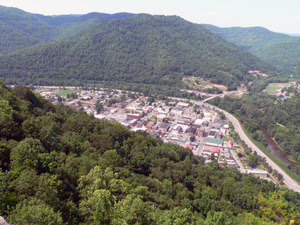 The park is pretty nice with approximately 15 miles worth of hiking trails, including the 1 mile hike to the Chained Rock and back. We even saw signs suggesting black bears are in the area. The day we went was fairly hot and we really didn't know what we were getting into, especially with a Shitzu that has never hiked a trail in his short 6-7 months of existence. The hike down to the rock, yes that's right down, was nice and only a half mile. Of course with it being down to the rock you know that means the hike out is all up. We didn't count, but I'd say there are at least 150 - 200 stairs on the trail. Luckily there are plenty of rest stops along the way. At least 3 benches to sit on along the way. With the thoughts of black bears in our heads we were about a quarter the way down the trail when we heard a big rustling amongst the brush and leaves ahead and to the side of the trail. We proceeded cautiously with our eyes peeled. Of course if we had paid attention to Clover and Zorro, we would have know it was nothing to worry about. As we got closer though the rustling grew louder and louder. When we finally got close enough to the source, our eyes beheld a ferocious gray squirrel frolicking around. Of course, once Clover seen it she was ready to put on the chase. Luckily her leash is pretty strong and so am I. Zorro on the other hand wasn't as worried, as he had more interest in sniffing every previously marked spot along the trail and reclaiming it for himself. We finally made it to the rock and what a wonderful place for the human kids to play. Yes, that means Ashby and myself. 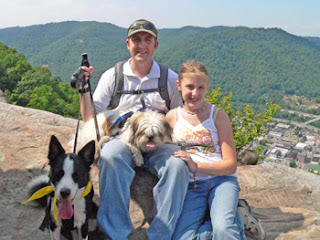 Of course with both doggie kids and Robin who is not much on heights, we really couldn't play a whole lot. Nevertheless, we did have fun and we did play just a bit, as well as enjoyed the view. Once we were done exploring and capturing the scenery on fluzz (the camera) we started the trek back up the mountain to the trail head. Zorro had to take a couple of breathers being short legged and not very experienced on trails. Otherwise he did really good. Clover also did exceptionally well with the slow pace and stairs. Clover isn't very big on stairs but she does love to push the pace. Robin, Ashby and I were quite winded once we got back to the top and were ready to head out. Overall the hike was wonderful even if it was hot. We will definitely be going back to explore the other trails they have to offer, although we will definitely wait for a bit cooler climes. Enjoy the shots below, I know it will make you want to see it for yourself. Up next.... It's a Cove... No..It's a Lake... No It's Cove Lake. P.S. It was after this journey that both pooches decided they wanted to have Pawports to track where they have been adventurin' to.